Yesterday I ran a half marathon in South Louisiana. As I was driving to South LA Fri afternoon, I stopped in Slidell to visit Nikki and Terrod. On May 2, 2013, our local running club was hosting a fundraiser for the Boston bombing victims. 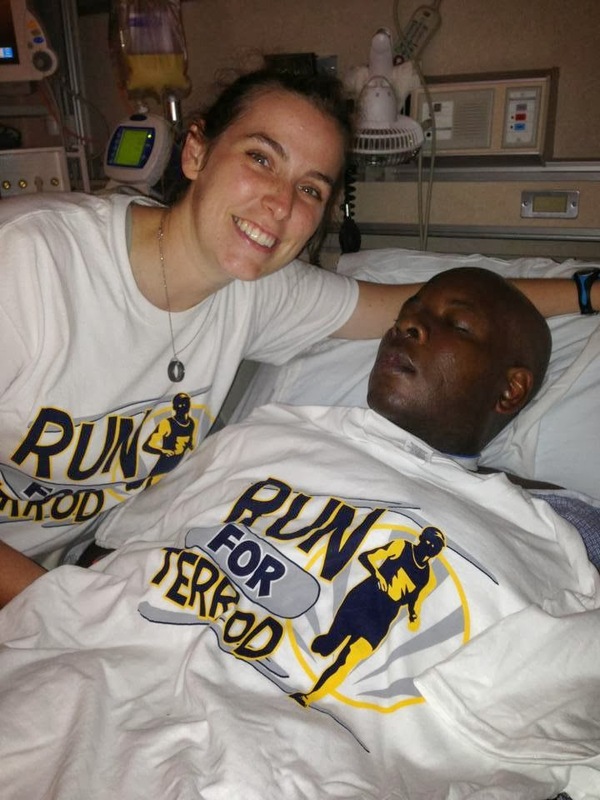 Terrod was participating in the run when he collapsed on the course. "Terrod Jackson was participating in a memorial run for the victims of the Boston Marathon bombing on May 2, 2013 in Hattiesburg, MS. He collapsed about 2.5 miles into the run. Fellow runners initiated CPR and Terrod was quickly transported to Forrest General Hospital. He spent 4 weeks in ICU at Forrest General and another 5 weeks at Regency, a long term acute care facility in Hattiesburg. On June 11, 2013 Terrod was transferred to Touro Infirmary in New Orleans, LA. During his 13 weeks at Touro, Terrod participated in intense therapy which allowed great progress to be made. The family was informed in the earlier weeks that Terrod would never be able to breathe on his own (trach removed July15), talk (July 24), or walk (September 20). On October 16, Terrod had a Baclofen pump implanted to help with his tone, pain, and muscle spasticity. The next day he moved to Trinity Neurological Rehab Center in Slidell, LA. Since arriving at Trinity, Terrod continues to make progress both physically and cognitively. He is able to communicate, but has impairment to his memories and often becomes frustrated because he can not adequately express himself. There has been research conducted in hyperbaric therapy among brain injury patients to help improve cognitive and physical abilities. The idea behind hyperbaric therapy is that anoxic brain injuries are caused by a lack of oxygen to the brain. They hyperbaric chamber is designed to increase the standard oxygen pressure which would cause over-oxygenate the brain and help revive the brain tissue. Hyperbaric therapy for brain injury patients is still in the research phase and there is no documented research showing that it does or does not improve cognitive functioning. Trinity has a hyperbaric chamber and the staff reports great improvement in brain injury patients who undergo hyperbaric therapy. Since there is no documented data with brain injuries, insurance will not cover the costs of therapy unless it is used for wound care. Hyperbaric therapy includes 20-40 "dives" costing approximately $200 per dive. The family wishes for Terrod to participate in hyperbaric therapy, but is unable to afford it without the assistance of insurance. This fundraiser is to assist the family in paying for the therapy. Terrod is a Computer Technician at Oak Grove Middle School in Hattiesburg and is also a Technical Sergeant in the Mississippi Air National Guard serving in the 255th Air Control Squadron out of Gulfport." Not knowing Nikki or Terrod, it was hard to make that first step to go and visit. From the door of his room, as I awkwardly call out Nikki's name with a ? mark, I'm immediately at ease. Nikki is simply amazing. She is a sweet, supportive, and optimistic wife. She misses her "normal" life with Terrod. I'm amazed at her calm spirit and her faith. There are good days and bad days, but she is staying optimistic and focusing on the future. I hope that you will consider making a donation to help another runner. As I ran the race on Sat. I had no intentions of "racing" it. I'm not in shape for that, and haven't done speed work, tempos, or much of anything more than cover 12 miles slowly, and 2-4 days a wk of slow running. This run wasn't about racing. I signed up with the intention of covering the distance. Even with low expectations for "a finish time", I did hope to be able to run it under 2 hours. As the race begins in Houma, very early on, the thought crossed my mind, "what are you doing here?" immediately as that thought finished, my next thought was of Nikki and Terrod. I thought about my visit with Terrod and how he would LOVE to be out on this course, just simply covering the miles. What are you doing here? this is the answer in my head - "you are here "because you can" and MANY others would love to be able to do what you are doing at this moment." I did that ! My thoughts turned to being happy for great running friends, my thoughts turned Terrod and Nikki several times during the race, my thoughts turned to being grateful for my health body, my thoughts turned to enjoying the beauty of South LA, my thoughts turned to being grateful for "showing up" today. From that early ? in my head, the rest of the day was uplifting, motivational, and fun. I'll be honest, it is a "process" to let the "numbers" go. After all, most of my years of running have been focused on running faster, or simply "chasing PRs." Maybe I'm done with "chasing PRs", maybe I'm not, but I'm happy that , yesterday was a breakthrough. Yes, I can be happy, out on the course, "just running", not chasing a number. I haven't followed the exact Maffetone heart rate running protocol, but post-injury, most of my runs have been at my MAF zone of 140. (since starting back in July). In July, while running very short distances, I would need to walk to keep my heart rate in this zone. My average paces would sometimes be as slow as 11-12 min miles. Again, during this run, I wasn't monitoring my heart rate, but I found it interesting that I covered 13 miles at my MAF zone, with a pace of 8:52. Definitely, not blazing speed, but it does reflect that I am getting in better shape, and to date, I'm improving with no quality runs, other than a couple of 5ks recently. I'm excited that the weather is good for running and racing now. I'm excited that it's "race season." I will not be "racing" as I'm accustomed to, but I'm excited to be "racing" as I'm racing now. Please consider making a small, or large donation for Terrod.